Applies to: ONTRAPORT Plus and above. This integration allows you to create a Connect with Facebook button and place it on your website. When clicked, the button connects the person to their Facebook account and, with their permission, opts them into your Contact database. The first name, last name and email address are added. You must create a separate Connect with Facebook button for each website or domain. Facebook frequently changes their interface, and often split tests pages. Some of the images and explanations may not exactly match what you see in your Facebook account. We have provided links to the Facebook documentation where needed. 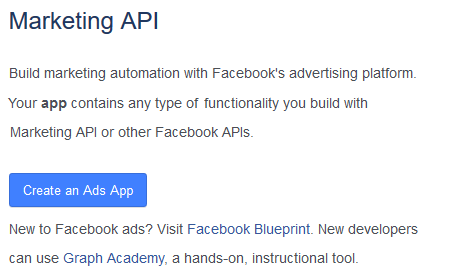 Visit Facebook Marketing API and click Create an Ads App. Click Create to create a new Ads App. Name your new app, provide your Contact Email, and click the Create App ID button. In the left menu, click Settings and then Basic. Click the +Add Platform button at the bottom. Select Website from the dialog box and enter the URL you will be installing the Connect with Facebook button on. Note that you will need to create a separate app for each unique URL you install the button on. Copy the App ID at the top of the page to a text file for use in ONTRAPORT later. This completes the Facebook App configuration. You do not need to make the Facebook App live, or submit it for review. 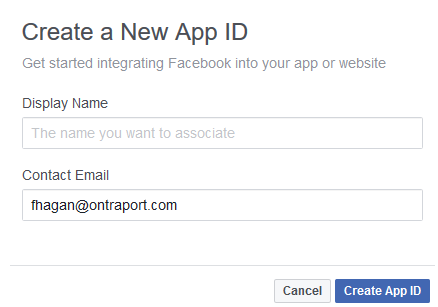 ONTRAPORT needs only the App ID copied in step 7 to configure the button. Click New Facebook App and fill in the first two fields. The App Name does not have to match the Facebook App name, but it does make it easier to edit later if you use the same name. The Application ID is the App ID number you obtained when creating the application. Set a redirect URL in the third field. After a contact opts in using Facebook they will be directed to this page. You can edit this setting at any time. Paste the code on your web page where you want the Connect with Facebook button to appear. Save the page and test the button function. Facebook may display an error code when you click the button. 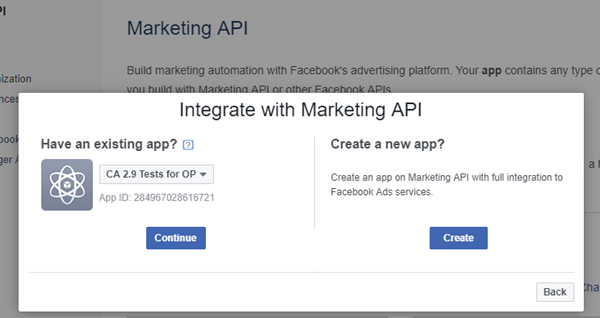 If it does, edit this line in the code: scope="email,public_profile,user_location,user_hometown,user_birthday,user_website,user_likes,user_friends" to read simply: scope="email,public_profile,user_friends"
There is no "Create an Ads App" option in Facebook Marketing API. The options are: Promote Your Page, Create Ad Reports, Setup Dynamic Ads, Build Custom Audiences or Create an Ad Rule. If it is not there for you please contact Facebook. They do frequent split testing of pages so what appears for me may not for you. 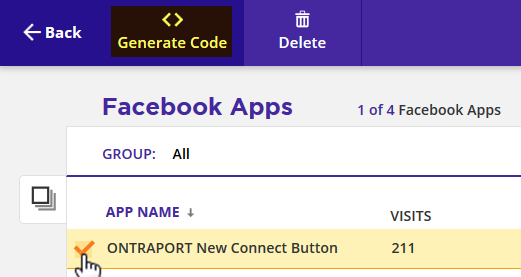 We are close to releasing a new integration that will not require you to create an app, but it is probably two to three weeks away from release (we are waiting on final approval from Facebook). Thanks for those details. Any chance this new integration has been approved/ is active yet? If so is there an Ontraport Knowledge Base page on it yet?